The Stunning original Hollywood mirrors are perfect for taking your makeup applications to the next dimension. These vanity mirrors feature high quality LED lighting which illuminates your reflection to help you create the gorgeous you every time. These are bespoke items and made to order. Lead time can be 4 -6 weeks. Beautiful hand selected Mirrored furniture, Sparkled interiors and home decor Including the original Hollywood Mirror Collection, our products are the ultimate in design and style. We believe every room in every home needs a magic ingredient, to take it from finished to fabulous. Sparkle your Space Furniture at home with Kerry Katona and OK Magazine. We at Sparkle Your Space have carefully selected all our items, with a view to helping you enhance your home and illuminate your space, with stunning furniture and furnishings. From the full Hollywood glamour look, or quiet sophistication at Sparkle your Space we have a stunning range for you to choose from. Enjoy browsing our website and upgrade your home in style adding Sparkle to your Space. Kerry Katona has joined the sparkle your space trend. Creating effortless luxury Kerry choose our stunning mirrored console table with curved stand. Demonstrating excellent taste, Kerry has chosen the perfect spot for her new table. Enjoy the video where you can see how please Kerry is with her purchase in the link. The latest look which brings effortless luxury and style to your home. Creating a feel of space and to your modern space. This style suits most style of homes with its timeless look and feel. High quality furniture items without the designer price. Sparkle your space has a Jan sale on, so what better time to revamp your home. Simply quote Jan 18 at checkout. November 05, 2017 Why Is Mirrored furniture so Popular? 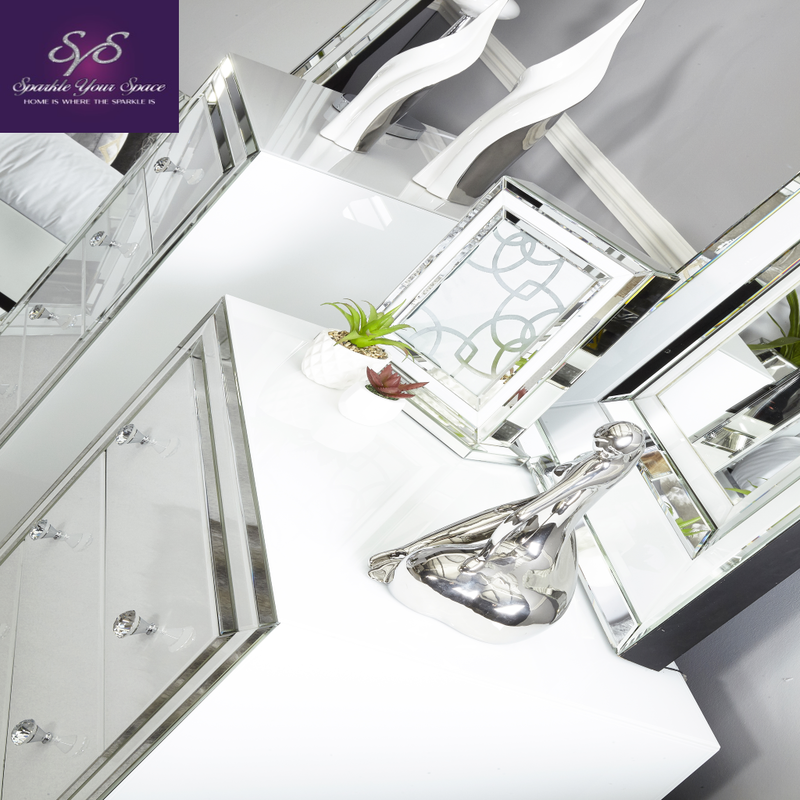 It is evident that the trend on Mirrored furniture is around for some time, so why is it so popular? Mirrored furniture is versatile and works well in many styles of home. If you are looking for full Hollywood Glamour or quite sophistication a mirrored furniture piece makes the statement you are looking for. Adding light and space to your room, and giving the all-important sparkle to your space. The starting point is identifying if you want to transform a whole room or have a one-off feature item to compliment your current unique style taking your home from finished to fabulous. At Sparkle your Space we have an eclectic collection for you to browse and find your perfect item from bedroom furniture, living room furniture, home accessorise, Hollywood Mirrors, Swarovski Crystal Liquid Art, Candle holders, so enjoy browsing our website to find the perfect items for you home.